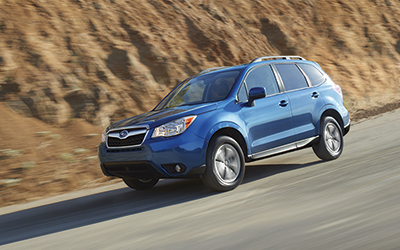 The 2016 Legacy, Outback, Forester, Impreza, Crosstrek and WRX with optional “EyeSight” received the IIHS’ highest standard of safety, the 2016 “TSP+” award along with the highest possible rating for the five crashworthiness tests as well as front crash prevention. Tokyo, December 10, 2015 – Fuji Heavy Industries Ltd. (FHI), the manufacturer of Subaru automobiles, today announced that the Insurance Institute for Highway Safety (IIHS; a nonprofit organization supported by auto insurers in the US) has awarded the highest standard of safety, 2016 TOP SAFETY PICK+ (TSP+), along with the highest possible rating of “Good” for five crashworthiness tests as well as “Superior” for front crash prevention with the highest possible score of 6 points, to the 2016 Subaru Legacy, Outback, Forester, Impreza, Crosstrek* and WRX currently sold in the North American region, equipped with Subaru’s “EyeSight” driver assist technology. IIHS has strengthened the requirements for both 2016 TSP and 2016 TSP+. To qualify for 2016 TSP, a vehicle must earn “Good” ratings in five crashworthiness tests – small overlap front, moderate overlap front, side, roof strength and head restraints – as well as a “Basic” rating for front crash prevention. To qualify for 2016 TSP+, a vehicle must earn “Good” ratings in the five crashworthiness tests and an “Advanced” or “Superior” rating for front crash prevention.